Three renowned Houses of artistry and time collaborated to engineer and design the amazing Atmos Hermès clock. Manufactures Hermès, Jaegar-LeCoultre and Les Cristalleries de St. Louis united their collective knowledge of art, science and materials to forge an innovatively diametrical sphere of horology. Their collective collaboration is a three-dimensional visionary translation of technical philosophy meets fine craftsmanship that masterfully conveys one language – the Living Essence of Time. The Atmos Hermès clock is an artistic marriage of glass and metal innovatively enveloped into a handcrafted crystal sphere housing a self-sustaining perpetual movement. Hermès entrusted Manufacture Jaeger-LeCoultre to develop the scientific self-sustaining perpetual movement inside the Atmos clock. It is amazing because Atmos operates without the use of a battery or electrical current; it merely uses air – that’s right it breathes (so to speak). Atmos incredible feat is due to a hermetically sealed capsule filled with a mixture of gases. The gases expand inside the capsule when the temperature rises and contracts when the temperature falls. This same capsule is also connected to the mainspring of the clock and acts like a concertina consistently winding the movement. This mechanism is so sensitive that a mere one-degree temperature difference is said to be enough to power it for an entire 48 hours. Atmos balance oscillates twice a minute allowing it to consume less energy in contrast to that of a classic wristwatch which oscillates an average of 300 times consuming 250 times as much of energy. Hermès communicated the vision of Atmos to Les Cristalleries de Saint-Louis, who in turn meticulously designed and handcrafted the crystal sphere housing the amazing movement of the clock. Les Cristalleries de Saint-Louis master glassblowers employed blowpipes to collect molten white enamel and fashion it into a ball known as a gather; a process that involved glass blowing, consistent heating and shaping of the gather using a mailloche or shaping block as well as layering overlays of white enamel. This glass blowing process goes through multiple technical techniques and processes until the glass mass reveals transparent pearl-like beads, which are polished to present subtle light effects. The sphere is worked, cooled and reheated until it weighs approximately 10 kilos, it is then perforated allowing for the insertion of the mechanism. The laborious complexity and painstaking artistry employed in the making of the Atmos crystal sphere is scantily address here but the overall process requires the efforts of four master glassmakers to create the elaborate exterior of the Atmos clock. Hermès, Jaeger-LeCoultre and Les Cristalleries de Saint-Louis collaborative efforts demonstrates the diametrical flexibilities that horology and art can achieve in the visionary translation of time. A visionary translation that makes the Atmos Hermès clock a limited edition of only 176-pieces. The Atmos Hermès is indeed a clock that the Houses of art and time built speaking a language that is the living essence of time. In 2010, Hermès recreated several pieces of furniture based on Jean-Michel Frank’s furniture designs. The French interior designer known for his minimalist aesthetic and luxury materials was a strong proponent of straw marquetry, an intricate art form that has all but disappeared in recent years. Presenting such artistry on a watch dial requires an extremely complex miniaturization technique, one that differs greatly from straw marquetry in relation to furniture. The two versions of the new Arceau Marqueterie de Paille display elaborate backgrounds that show the hard work put into their production and the novelty of straw marquetry applied to watch design. Originally designed in 1978 by Henri d’Origny, the Arceau has now been released in two new versions. 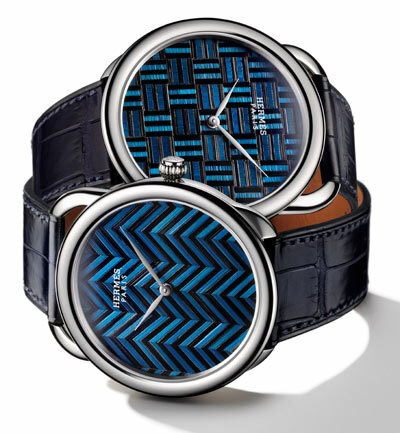 They differ only in the black and blue motifs of the watches, with the trademark Hermès tie patterns of either chevrons or tiny squares, encased by the 41 mm diameter white gold case. The model also features the asymmetrical lugs from the original model, with the stirrup-fitting shape evoking images of the brand’s traditional saddle-making roots. Manufacture Vaucher’s Calibre H1928 movement, made specifically for Hermès, self winds the two Swiss-made models. The 220-part timepieces glitter with 32 jewels, pack a 55 hour power reserve and run at 28,800 vph. The matte indigo alligator watch strap finishes the look by matching perfectly with the straw dial. Today, only one French farm produces the rye straw needed to create these models. Already the optimal straw by virtue of its length and lack of knots, the rye still must undergo hand reaping to select the most usable parts. After mass coloration and a drying period, craftsmen subject the straw to a variety of weather conditions before being split open with a blade. 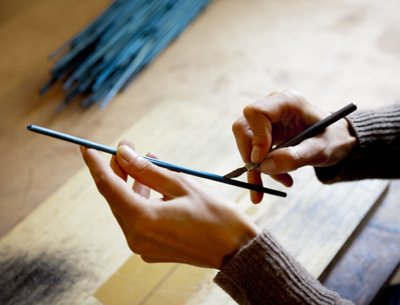 Much physical strength is used in cutting up wisps before the artist configures how to assemble them. Finally, the straw marquetry is laid out in its ultimate glory on the watch dial, akin to the process needed to create leather-bound books. The venerable House of Hermès takes considerable pride in hands-on craftsmanship, especially those involving leather, as the brand has made saddles since 1837. Many other materials, precious or humble, find their place among Hermès workmanship and join together hand coordination with brainpower to create objects that embody the brand most. The Arceau Marqueterie de Paille is thus a prime example of Hermès’ artistic expression. 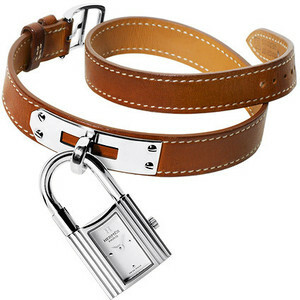 If you’re a consumer of Hermès you are undoubtedly familiar with the quality of its luxury products. However, if you’ve just stepped off of spaceship ‘What planet have you been hiding on?’ the documentary “Hearts and Crafts” will bring you up to warp speed. “Heart and Crafts, ” cleverly directed by Frédéric Laffont and Isabelle Dupuy-Chavanat, captures the essence of what makes Hermès designs and products so invaluable – its artisans. In this documentary viewers are literally transported to several of Hermès’ ateliers (workshops) and become acquainted with these meticulously skilled artisans. It is their voices and personal stories that weave a visual picture of the rich handcrafted equity that goes into designing each of Hermès saddles, handbags, drawings for silk scarves, mixed colors for silk screening of its scarves, jewelry, moulds made for crystal and glass works, and yes, even its leather watch straps. Each of their stories is one of discovery, rediscovery, the freedom that encompasses artistic expression and the unrivaled task to always achieve perfection. This cultivated culture is the thread that unifies these artisans and reflects the heart they institute into their work, their masterpieces. Discerning Hermès consumers understand that they aren’t just purchasing luxury watches or fashions per se, they are purchasing the very essence of conscientious Hermès artisans. Their purchase is one steeped in historical tradition that has been passed down from generation-to-generation. It is the embodiment of hearts and crafts. The documentary “Hearts and Crafts” is available for viewing on Hermès website, www.Hermes.com, click on United States in the left margin and look the “Heart and Craft” link. Ever wanted to stop time? Maybe just freeze that moment for a while? Hermes has found a way with their cutting-edge timepiece, the Arceau Le Temps suspendu. Founded in 1837, Hermes began their business as a Parisian saddle shop. Creating some of the finest harnesses and bridles for the carriage trade, Thierry Hermes earned first-class awards for his work. Eventually expanding into leather goods and clothing, handbags and scarves, Hermes hired Swiss watchmaker Universal Geneve in the mid-1930s as the brand’s exclusive watch designer. The Hermes Arceau Le Temps suspendu is a watch with a new aspect on the subject of time. A stop/start push-piece on the side of the watch at the 9 o’clock position allows you to “suspend time.” It stops the hands by sending them back to the 12 o’clock position. There they will stay until called back by the owner. And when the watch is called to resume time with the push of the button, it picks up right where it left off with no lack of precision. To make such a complicated timepiece, Hermes enlisted a well-known expert in retrograde displays, Jean-Marc Wiederrecht with Agenhor. He explains that the watch has three retrograde hands that rotate between actual time and suspended time. These two function through the third module which is based on two coordinating column wheels. When the button is pushed to suspend time, a column wheel raises a segment of the watch. Sound complicated? It is. New technology has permitted the points of the cogs to be exact to within one micron. The system is composed of 140 parts and took about four years to develop. The watch comes with either a matt Havana brown or black alligator leather strap. It is water-resistant to 30 meters and has a power reserve of 42 hours. The case size is rather large at 33 millimeters. The bezel is round with Arabic calligraphy numerals and a hallmark on the face. 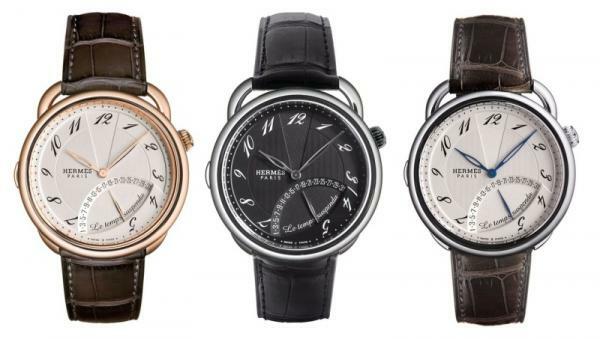 Hermes has certainly mastered time with the Le Temps suspendu. The craftsmanship and precision required to create such a timepiece is beyond many watchmakers. This is a watch that lets you control time, to slow down and stop for a while. What other watchmaker can make such a bold claim? Crafted from a quality French brand that specializes in leather, perfumery and luxury goods, Hermes watches are a popular accessory in the wardrobes of some of the world’s most notable names and fashion icons. Chiara Ferragni, an Italian fashion blogger who has built an international fan base and caught attention from some of the industry’s most prominent designers through her fashion advice, was seen modeling the Hermes Kelly watch. Heidi Montag, American media personality and singer, was also spotted wearing the Hermes Kelly watch while walking with her husband Spencer Pratt. The Swiss luxury timepiece – inspired by and created as a tribute to the handbag that shares its name – features quartz movement, a gold-plated case with a white dial and a natural Epsom calfskin strap with white stitching. The watch is also available in a stainless steel case with a silvered or white dial and either a natural barenia double tour leather trap, smooth orange calfskin strap or Epsom calfskin strap in natural or black colors. The Hermes Code Cod watch has also been seen on the wrist of several notable and well-known figures. Isla Fisher, actress and star of Confessions of a Shopaholic, wore the elegant timepiece as an accessory to her character’s style in the film. “It’s an orange Hermes watch and it sums up Becky Bloomwood – it’s playful, young and hip,” said Fisher. The timepiece has also been worn by fashion stylist and designer Nini Nguyen, actress and singer Gwyneth Paltrow, actress Kelly Rutherford and actors Ashton Kutcher and Wentworth Miller. Inspired by the anchor-shaped peninsula of Cape Cod, the Swiss-made Hermes Cape Cod luxury watch was created in 1991. The timepiece features quartz movement, a stainless steel case with a silvered dial and is available with a steel bracelet or variety of different colored straps. Hermes is one of the world’s most famed luxury brands. Since 1837 when the brand was born as a Parisian saddle shop, Hermes products have been renowned for quality and innovation. The French company first began creating clothing in the early 20th century and followed with the production of handbags shortly after. The luxury brand began rolling out men’s and women’s watches in the 1950s, including art deco and classic leather styles. During this time, vintage watch bracelets from Hermes were seen as some of the most fashionable women’s wristwatches to wear. 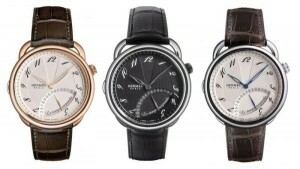 In the contemporary world today, antique Hermes timepieces are valuable collector’s items. Just as the quality luxury brand always has, Hermes continues to create fashionable, elegant and chic watches with a timeless design.